As part of my summer blogging break, I was planning to share 1 week of re-posts in June, July, and August… however, I’m switching things up for the month of August. Instead of sharing a week of reposts, I’m sharing a week of “compilation posts” where I compile all the information I’ve shared on a specific topic into one post for easy reference. 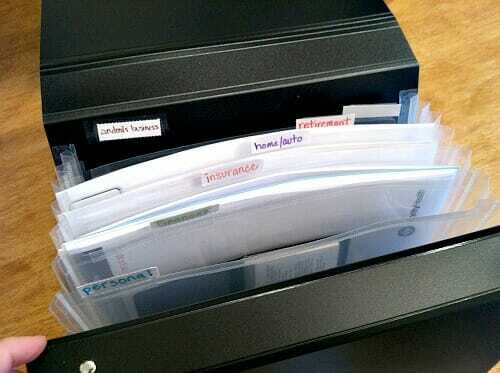 Our Important Information Binder is exactly like it sounds — a simple accordion folder/binder where we store all the documents and information that is very important for us, our family, our home, our finances, etc. Sometimes we make photo copies of important documents for this binder and keep the originals in our fire-proof safe, but most of the time, the originals are in this binder. 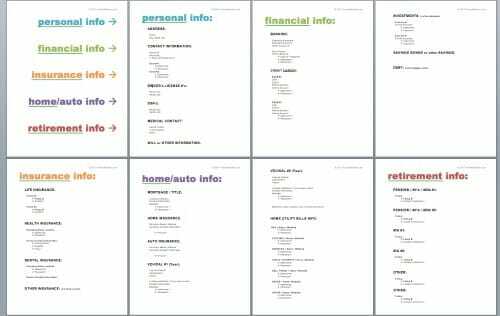 It gives me such a huge sense of relief to know that all of this information is neatly organized (and up-to-date) in the event that something would ever happen to me or Dave or both of us. It might take you a bit of time to set up your own binder (especially if you need to get your hands on various legal documents), but once you do, you’ll have such a huge sense of peace knowing that your affairs are in order and someone else could step in to run your life if need be. Instead of re-typing or copying and pasting all the information, I’m sharing the links below so you may pick and choose what information you’d like to read and when. If you’re struggling with paper clutter in general, here’s a post that details exactly how we store all the paper clutter in our home. Here’s the Amazon link to the exact same binder we use — however, feel free to use a binder you already have in the house! 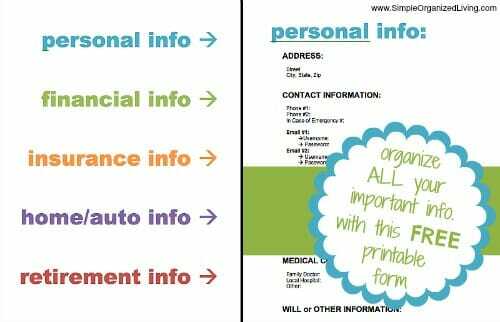 These are the exact same printables we use for our binder — they are simply Word documents, and 100% editable (nothing fancy but they work!) All I ask is that you don’t republish them on your own site or try to sell them! I know the summer and fall months aren’t typically a time we think to organize our paperwork… but wouldn’t it be so fantastic to have this binder finished by the end of the year?!?! Sort of a little Christmas gift for yourself! Thank you for the organization tools to do this so easily. I had read your posts in previous years, had even ordered the binder 6 months ago, but I finally sat down and dis it last week. Thanks for the motivation! Awesome! I’m so happy to hear this Amber! This has been on my list of things to do for at least a year. Two weeks ago, my husband had a stroke. He’s 55 years old, 170 lbs., non-smoker, healthy eater, exercises and has no family history of strokes. To say that this rocked my world, would be an understatement. I saw the stroke happen; both my daughter and I know CPR so we immediately called 911. He was given the reversal drug for the stroke and flown by helicopter to a nearby hospital for a Thrombectomy. Luckily, he is doing well but is not able to work yet. With all of this being said, I never in a million years thought this would happen to my family. 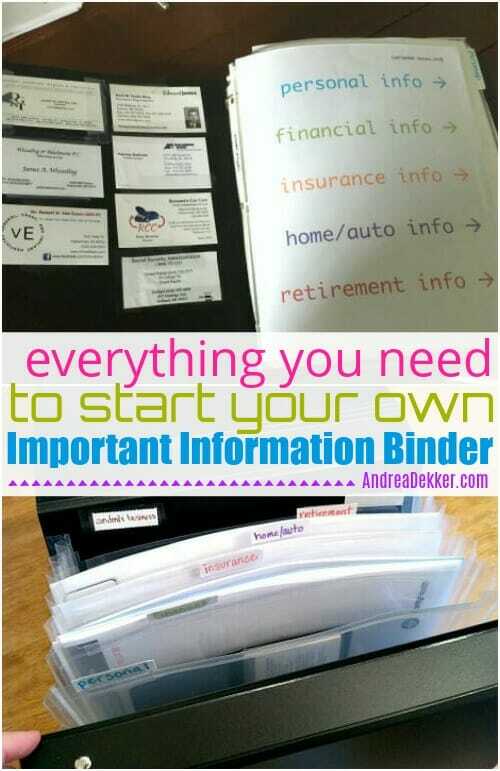 So it is on my list of ‘to do’s’ to get all of my information put into a binder. Thank you again for this reminder. oh wow — that’s so young! I’m glad he’s doing OK… and yes! get your binder together!! I think this should be a monthly post because it is so important. My mother passed away earlier this month after being diagnosed with stage IV cancer only a month before her death. She was only 66 and did not have any of this stuff taken care of. 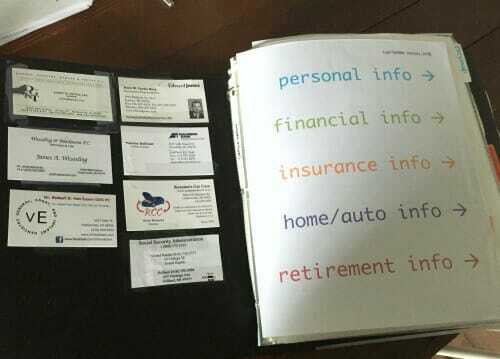 It is devastating losing a parent so quickly but then to try to deal with all the paperwork (loans, mortgage, credit cards) and not having access to computers, phones etc. is so hard. My step dad doesn’t even know the password to their wifi. 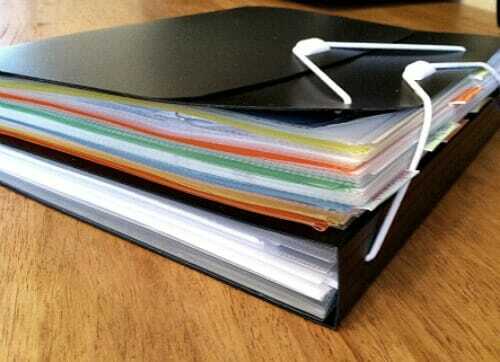 This binder would have been so helpful. I started mine a while ago but will be finishing it soon. Sorry to hear about your mom Jane! I can’t even begin to list how many times people have said this exact same thing to me… “this would have been so helpful to have before ______ passed away”.